By waiting until the 11th hour (again) to agree to raise the U.S. debt ceiling, U.S. policymakers are walking across a very dangerous economic tightrope. Even if last night’s deal wins the approval of Republican Congressional leaders, politicians in Washington are taking huge risks by potentially disrupting the biggest financial market in the world. Though nothing is certain yet, the U.S. government appears that it will avoid the worst-case scenario and won’t default on any of its debt - thus preventing an interruption of over $100 billion in payments, a sharp reduction in federal spending could cut U.S. economic growth by 6 to 10 percent, and increase unemployment by 3 to 5 percentage points, or 4 to 7 million people. However, the effects of the debt ceiling standoff could be severe. Long perceived as the safest asset in the world, U.S. debt is critical to many of the world’s financial markets. Numerous markets benchmark prices to that of U.S. debt, and depend on U.S. bonds being repaid. The staggering scale of these markets makes even tremors dangerous. $11.9 trillion worth of U.S. federal debt is outstanding in the market, and these debts back the $38.7 trillion bond market in the United States. This figure is more than double the size of the U.S. economy, 86 times larger than the value of Apple, and nearly 170 million times larger than the average home loan. 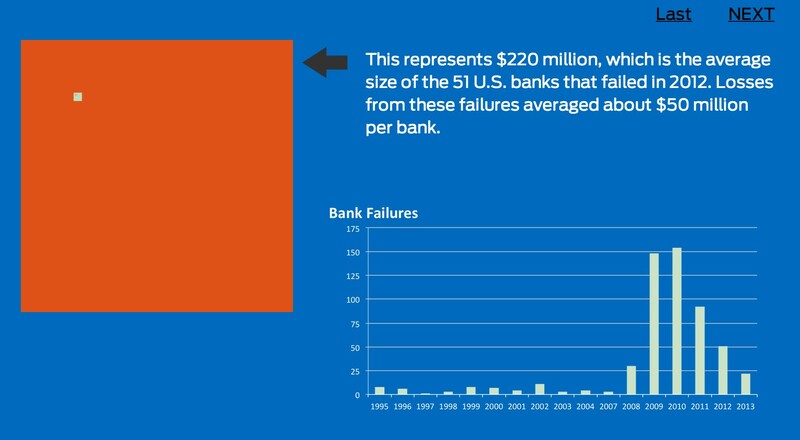 To attempt put this number in perspective, the interactive graphic below allows you to compare it to other famous or more familiar financial entities. Though it remains to be seen how the rest of this crisis plays out - and just how disruptive it proves to be - it’s important for leaders to understand just how big of a bomb they could be standing on. The data and code behind the visualization can be found in this Github folder. The visualization also used the following sources for data on used car prices, home loans, household incomes, bank failures, famous bankruptcies, stock prices, U.S. public debt, Treasury bill rates, and the U.S. bond market. I’m always looking for new datasets and cool problems to write about. If you have questions that you think could be answered with data — on topics ranging from what motivates politicians’ votes to San Francisco parking and drug prices—I’d love to hear new ideas. Feel free to reach out at benn@modeanalytics.com.